Image caption The knitted sandwiches have a maritime theme and include a "fish butty"
A Whitby museum is displaying knitted food to celebrate the 250th anniversary of the invention of the sandwich. 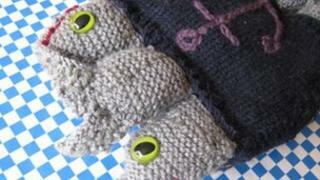 Over 100 sandwiches have been knitted by members of the public in honour of John Montagu, the fourth Earl of Sandwich. The earl is credited with inventing the snack as a way of eating while continuing to play cards. The museum said the entries would be judged by a university art lecturer and prizes awarded for the best examples. Entrants follow a nautical theme and include a "fisherman's butty" and an octopus baguette. The Captain Cook Memorial Museum is running the event to highlight the role played by John Montagu in supporting James Cook on his voyages of discovery to Australia and the South Pacific in the late 18th Century. Cook lived in Whitby before embarking on a career in the Royal Navy. John Montagu, as First Lord of the Admiralty, selected James Cook to command HMS Endeavour on the 1768 journey which led to Australia being claimed for Britain.